If you have any leftover Christmas turkey — especially if it happens to be smoked turkey, and especially if you have the carcass and bones — we highly recommend that you make stock, then use the stock to make soup. The smoky (almost ham-like) flavor of the turkey pairs particularly well with the earthy flavor of lentils in this soup. Although they are not difficult to make, the stock and soup do take some time. But a pot of stock simmering on your stove for several hours is definitely not a bad thing. It makes your whole kitchen smell delicious, and there is no better base for soup than homemade stock. Plus, you have the added satisfaction of knowing you squeezed every bit of smoky goodness out of your turkey, rather than just throwing the bones away. And if you don’t feel like making soup, you can portion out the stock into 1 and/or 2 cup quantities to freeze for later use. Homemade stock makes a surprisingly huge difference in the final flavor of almost any recipe calling for at least a cup of stock. (Just keep in mind that stock made from smoked turkey (as opposed to chicken or regular turkey) has a pretty pronounced smoky flavor that might not be welcome in certain dishes requiring chicken stock.) If you have the bird and the time, make homemade stock, is what we are saying. To make the stock, start by picking most of the turkey meat off the bones (refrigerate the meat for later use.) 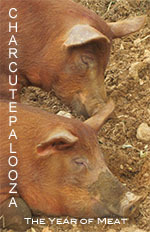 Cut or break the main carcass apart into several pieces and place them into a very large pot or Dutch oven. Add the remaining bones whole, then fill the pot with cold water such that the turkey bones are submerged. Add about a teaspoon of peppercorns and a bay leaf to the pot. Bring the water to a boil, then simmer (slowly bubbling, not boiling), uncovered, for about 2 hours. Adjust the heat as necessary to maintain the low simmer. Add the veggies to the stock — an onion, 1-2 ribs of celery and 1-2 carrots — all roughly chopped. Some homemade stock recipes don’t include vegetables at all, so don’t worry if you don’t have some or all of these veggies. The point of stock is to cook all the meaty flavor out of the bones — veggies just add another layer of flavor. Continue cooking the stock (uncovered) for another 2 hours, adjusting the heat as needed to keep it at a low simmer. Pour the stock through a strainer into a container and discard the turkey bones and veggies. We use a chinois strainer because it fits nicely in the container and has a very fine mesh to catch all the meat and veggie bits, but any fine mesh strainer or colander will do. Refrigerate the stock for a couple of hours so that the fat separates (the fat will congeal on top.) Prior to using (or freezing) the stock, spoon off the congealed fat (yummy!) and discard. Or, if you don’t have time to cool the stock before using it, a fat separator works well to allow you to pour out the stock separate from the fat. When you’re ready to make the soup, bring 4 cups of homemade stock to a boil. Once the stock boils, set it aside and keep the pot covered so the stock stays hot. Chop the veggies for the soup — 2-3 carrots, 1 large onion and 2-3 celery ribs — and mince 2-3 cloves of garlic. Heat a couple tablespoons of vegetable or canola oil in a large pot or Dutch oven over medium-high heat, add the veggies and cook until they begin to soften — about 4-5 minutes. Add the minced garlic and cook for about 1 minute. Add the lentils and a dash of salt and pepper, then cover the pot and cook over medium heat until the vegetables are soft and the lentils begin to turn a darker shade of lentil — about 8-10 minutes. Uncover the pot, increase the heat to high, then add the white wine and simmer for about 1-2 minutes. Add the hot stock and 1 1/2 cups of water. Bring the soup to a boil, partially cover the pot, and simmer the soup over low heat. 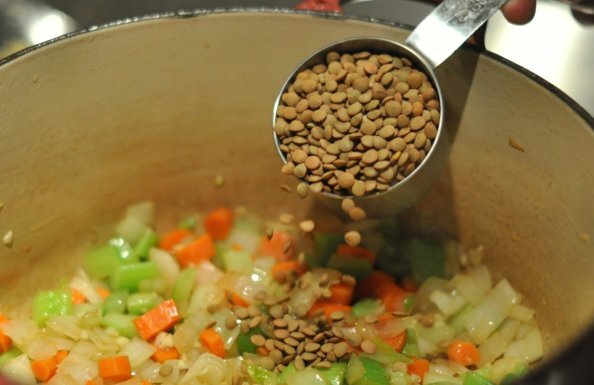 Simmer until the liquid reduces and the lentils are tender (but not mushy) — about 30-35 minutes. Dice about 2 cups of leftover smoked turkey. Add the turkey to the soup, increase the heat and cook until the turkey is heated through and the soup is hot — about 5 minutes. Serve the soup garnished with chopped parsley (and/or the under-used, but flavor-packed celery leaves), and enjoy the smoky delicious fruit of your homemade stock labor. Pick most of the meat off the turkey bones and carcass and set the meat aside for later use. Cut the main part of the carcass into several pieces and place in a very large pot or Dutch oven. Add the remaining turkey bones to the pot and fill with cold water such that the bones are submerged. Add the peppercorns and bay leaf. Bring the water to a boil and gently simmer, uncovered, for about 2 hours, adjusting the heat as necessary to maintain the low simmer. Add the onion, celery and carrots to the stock and continue to simmer, uncovered, for another 2 hours, adjusting the heat as necessary. Pour the stock through a fine mesh strainer into a container and discard the turkey bones and veggies. Refrigerate the stock for a couple of hours so the fat will separate, and remove the fat prior to use. Heat the turkey stock to a boil, keep covered and hot. Heat the oil in a large pot or Dutch oven over medium-high heat, add the onion, celery and carrots and cook until they begin to soften — about 4-5 minutes. Add the garlic and cook for about 1 minute. Add the lentils and a dash of salt & pepper, cover the pot and cook over medium heat until the vegetables soften and the lentils turn a darker shade — about 8-10 minutes. Uncover the pot, increase the heat to high, add the white wine and simmer for about 1-2 minutes. Add the hot stock and water, bring the soup to a boil, then partially cover the pot and simmer until the lentils are tender (but not mushy) about 30-35 minutes. For a more creamy texture to the finished soup, puree about 3 cups of the cooked soup in a blender until smooth, then add it back to the pot of soup. Add the diced turkey to the soup, increase the heat and cook until the turkey is heated through and the soup is hot. Garnish with chopped parsley and/or celery leaves and serve.